Source: NOTE The Norwegian central government is in a net asset position, i.e. the governmentâ€™s total financial assets exceed the total debt. They borrow cheap to then re-invest. According to the IMF, at the end of 2017, the Kingdom of Norway’s gross debt to GDP ratio was 36.66%, but its net to GDP ratio was -90.5%. That minus on the net debt figure is not a typo. Norway has a very large sovereign wealth fund, which outweighs its public debt by a very large amount. Norway is one of the few countries in the world that doesn’t need to borrow any money. Norway is a small country with a small population, but with a very long coastline. That long coast gets the country a big slice of the North Sea included in its national waters. The discovery of oil in the North Sea gave the country more money that it could spend, so the nation decided to put all of its excess income into a national pension fund. That fund is called the Government Pension Fund Global (GPFG). Despite the commitment to save money, the government doesn’t scrimp on its budget. The country has a very generous welfare program and free health and education systems. Despite all of that spending, the government always ends up with a budget surplus. The rarity of a government running budget surpluses is demonstrated by the title that the OECD put on this graph. 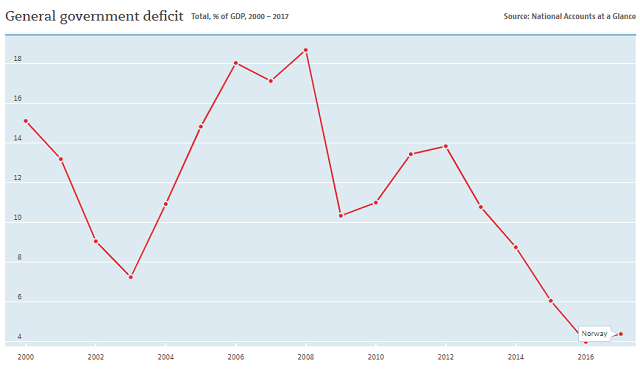 In fact, deficits would show in the graph as minus figures. Who manages Norway’s national debt? The Ministry of Finance is ultimately responsible for Norway’s national debt. The Ministry has passed the authority to raise debt to the Bank of Norway, which is called Norges Bank in Norway. All borrowing is denominated in Norwegian kroner (NOK). Why does the Norwegian government borrow money? Norway had a government debt before oil was discovered in the North Sea. Some of that debt is still live because government issue some bonds with very long maturity periods. The Kingdom of Norway still had debts left over from fighting the Second World War when oil revenues started to flow in the 1970s. Rather than paying that debt off early, the government decided to let the terms of the loans and bonds continue to their planned settlement dates. However, as the OECD graph above shows, the government doesn’t need to borrow any money any more, so why is the Norges Bank still issuing government securities? The government of Norway runs lending schemes and funds those through its own borrowings. Governments can borrow at a much lower interest rate than banks can, so this scheme makes loans cheaper for the general public and for enterprises. Another reason that the government sometimes needs to borrow money is to smooth out the irregular remittance schedule of standard government income streams. Short-term financing helps the government pay its bills and wages on time even though its income might not arrive until some time later. One more reason that the government borrows money is that there is a demand for government securities within the Norwegian economy. In any country, the availability of government securities underpins debt and money markets. Without the production of government debt instruments, the volume of corporate bonds might not be enough to warrant the existence of a native debt market. In that case, Norwegian businesses would have found it harder to raise financing because they would have needed to go abroad to a foreign debt market in order to issue bonds. Government bonds provide a benchmark for the debt market. In any country, government bonds usually provide the safest store for money and so offer the lowest interest rates. The price of a government bond helps brokers value the bonds of other issuers. How does the Norwegian government raise loans? The government does not sell its bonds directly onto the market. Instead, the Norges Bank organizes a club of buyers, who bid for government securities when they are made available. This group of authorized bidders are called Primary Dealers. These are Norway’s four main banks. As the pool of Primary Dealers is so small, bidding for allocations is never fierce. Other financial institutions, businesses and members of the public can buy government securities through the secondary markets. The primary dealers don’t hold onto their allocation. In fact, in many cases, they already have deals in place with customers before they put in a bid for bonds and Treasury bills. If the primary dealer doesn’t have all of its allocation pre-sold, those bonds will be listed on at the debt section of the Oslo Børs. The system is sufficiently open that large buyers of government securities can arrange to participate in a primary issuance with a Primary Dealer acting as a broker. What government securities does Norges Bank sell? Treasury bills are commonly used by all governments for short-term financing. The purpose of these securities is to allow governments to smooth out the irregular receipts of their traditional income streams. The government of Norway issues Treasury bills. Other governments will issue bills with 6 month, 3 month, 1 month, or even 1 week maturities as well a 1 year but the government of Norway only issues 1 year Treasury bills. The format of a Treasury bill is that it is sold at a discount and redeemed at full face value. Treasury bills do not pay interest. Norges Bank hold auctions of new 1 year government Treasury bills on the third Wednesday of March, June, September and December. The Norwegian government bond follows the classic benchmark bond format. Each bond has a maturity of 10 years and has a pre-stated fixed interest rate for its duration. Interest is paid once a year for the life of the bond and Norges Bank pays back the borrowed amount in full on the maturity date. The Norwegian government sometimes issued 11-year bonds, but stopped that practice in 2014. What facts should you know about Norway's national debt? You could wrap $1 bills around the Earth 601 times with the debt amount. If you lay $1 bills on top of each other they would make a pile 16,854 km, or 10,473 miles high.